If The 6 Series Coupe Is Supposed To Die Why Did We Just Catch It Testing? We really have no idea what to think about the 6 Series anymore. 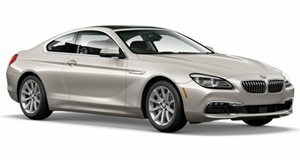 There has been a lot of chatter about the future of the BMW 6 Series this year. First we heard that the convertible and Gran Coupe could get the axe. Then a new report said that only the Gran Coupe would survive, this being because the revived 8 Series coupe would edge the smaller two-doors out of the lineup. Now our spy photographers have brought us these shots of, wait for it, a camouflaged 6 Series coupe out for testing! Despite being covered from head-to-toe in camo there is a bit of info we can glean about the new 6 Series coupe from these shots. The lights up front and in back are new and the grille has been given a shot of steroids. The roofline at the rear tapers off much more sharply than on the current model and overall the new two-door appears to be just a wee bit smaller than the current 6 Series. There was talk that the next coupe would be smaller and sportier, a Porsche 911 fighter if you will. The car in these photos is certainly smaller than its predecessor but BMW doesn’t seem to have gone the sporty route. It certainly looks sportier than the current 6 Series and the camo is pretty intense, but with its current shape we just don’t see how it would seriously go at the 911. That being said, we don’t think anyone will be disappointed in the new 6 Series if it can’t fight Porsche head-on. How can you dock BMW for making a sportier and slimmer grand tourer? Even if the base model can’t match up with the 911, the M6 should be a new beast entirely. The smaller size and lighter platform should pair well with BMW’s burly 4.4-liter twin-turbo V8, or whatever other V8 it decides to drop in there. As for the convertible, our spies say one should debut six months after the coupe. The German automaker loves plugging the holes in its lineup and if the coupe is kept it makes sense that the convertible would stay. Then again, every report seems to indicate that the droptop is marked for death. Then again (again), said reports also said the coupe was out and here it is! At this point, believe what you want and accept only pictures as proof.